Evoking a pristine quality, 2016 Panini Impeccable Football is another new high-end brand as part of Panini's NFL exclusive. Each premium hobby box promises five autographs. Featuring considerable rarity, 2016 Panini Impeccable Football has nothing numbered higher than 99, and that includes the base set. Limited to 75 copies, the 100-card base set features both veterans and retired players on canvas stock. 50 Rookie Autographs (#/99) add to that with key players from the 2016 NFL Draft. 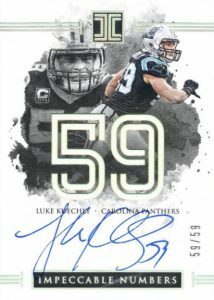 Largely centered around the signed inserts, 2016 Panini Impeccable Football highlights include Elegance Veteran Patch Autographs with only prime jersey swatches to go along with an on-card signature and print run as low as five copies. Elegance Rookie Helmet Patch Autographs take a similar approach with hard-signed cards but substitute different relics in a dual format. 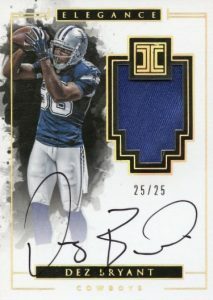 More standard signed inserts in 2016 Panini Impeccable Football include on-card Indelible Ink Autographs (#/99) as well as parallels such as Gold, Platinum, and Printing Plates. Impeccable Jersey Numbers Autographs, to no real shock, display jersey numbers from top players, again with on-card signatures. Inkpeccable Duals, Trios and Quads up the signers per card and cut the print run to no higher than 25 copies. Impeccable Cuts are limited to five copies or less and showcase NFL legends. Seemingly the only unsigned inserts in 2016 Panini Impeccable Football, and a case hit, Silver NFL Logo (#/15 or less) cards contain pure silver and are joined by Gold NFL Logo cards. The inserts each offer one troy ounce of silver or 14K gold that features the NFL logo. 2016 Panini Impeccable Paxton Lynch Helmet Auto Patch RC 15 BGS PRISTINE 10! PARALLEL CARDS: Silver #/25, Gold #/10, Platinum 1/1. PARALLEL CARDS: Silver #/25, Gold #/10, Platinum #/5, Printing Plates 1/1. PARALLEL CARDS: Helmet and Nameplate #/15, Dual NFL Logo 1/1. PARALLEL CARDS: Gold #/25 or less. PARALLEL CARDS: Holo #/25 or less. PARALLEL CARDS: Gold #/10 or less, Platinum #/5 or less, Printing Plates 1/1. 25 cards. *Cards #8, 9, 10, 14, 19 - serial numbering not listed. PARALLEL CARDS: Silver #/49, Die-Cut #/99, Die-Cut Silver #/49, Die-Cut Gold #/25. lol, “high end”, Panini’s version of high end is 75% sticker autos. this hobby will be a joke in two years, from a football perspective. Sad, sad day, when reality sets in for all of us that there really isn’t any Topps being released….. ugh. Panini Will Ruin Hobby � High-end more speaks to the pricing ($500 for 8 cards) but I certainly know what you mean. I’m not the smartest guy but isn’t it a monopoly the way Panini is running football? When big companies take over the market the government steps in and puts a stop to it. 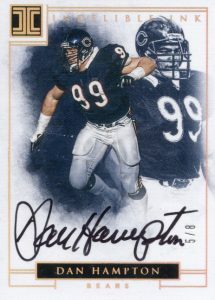 I know these are just football cards but it’s still a million dollar business. Not sure if you are blind, but u can see in the picture that they are not stickers and it says on-card right in the article. You want to know who ruins the hobby?…the collectors nowadays. What a bunch of spoiled whiners!! This looks like a beautiful product and as a REAL, true collector who actually enjoys collecting cards, I’m glad we get a chance at such beautiful, high-end products! Thank you Panini!! yes, the product does look beautiful and it gets old seeing a lot of people bash any and all products and accuse companies of monopolizing the market. Some of it may be true but just once, Id like to see a product where someone is not bashing it because they didn’t get the “HITS” they wanted. seriously guys, just enjoy how far along cards and the hobby have come these days. There are multiple groups on Facebook, multiple forums to discuss products plenty of beautiful cards to go around. Just enjoy it. Looks similar to Topps Definitive. The 14k cards contain half a Troy ounce while the silver are a Troy ounce. The cards look really sharp but the price is outrageous, at $2-300, I’d buy. 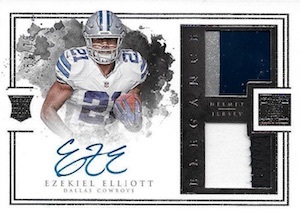 This prohibitively priced pigskin product is thematically quite similar to both “Flawless” and “Definitive.” Pairing precious metals, gems and minerals with low-numbered prints seems to REALLY get peeps’ a pumped. In terms of design? My first thought upon setting eyes on the product was that the rookie and veteran auto patches bear a more than a passing resemblance to Topps Museum Collection. The postage stamp sized windows and horizontal layout of the card makes it highly desirable. All you people complaining, mad cause you can’t afford to buy. Come on now think about it, aren’t you tired of seeing low end card products. You can complain, but panini got their money lol jokes on you. 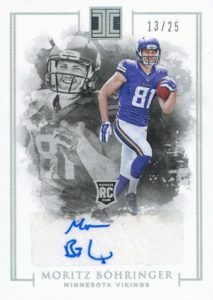 Product is great how often do you see a Joe Montana, Aaron Rodgers etc on card auto’s. Keep it coming Panini love it. I got the Elway Superbowl sig last night in a mixer break, any idea what the actual production run is on those? Impeccable is the nicest set of 2016. The duel shield cards are the best 1/1’s out their right now. Well done Panini. Their are plenty of sets to complain about but this isn’t one of them. This could’ve been easily a 5 Star Product IMO. The majority of the cards are just beautiful and the black & white design plus team color are awesome. Most of the Patches are 2 or 3 colored and cards which are on card signed look extremely well. The cards I have are also in pretty could quality and could achieve good grading. Overall a lot of things went right with Impeccable. Now the reason why it’s just 3 Stars. For a price of a Box like Impeccable it’s an absolute �no go� that there’re so many sticker autographs in it. Panini just doesn’t get this, it’s high end so no stickers. Period. I’m looking now for weeks to an Immortal Ink card at eBay of John Elway (a 1 of 1!) and it has a sticker autograph on it, that’s unbelievable. 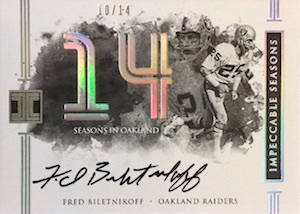 Legends with sticker autographs (beside all the scrub rookies), no thanks! As usual not worth breaking boxes, but definitely worth to hunt down the cards you want on the secondary market. 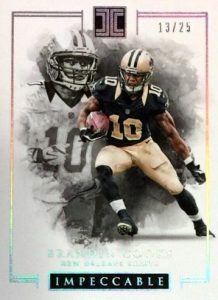 2016 PANINI IMPECCABLE NFL Football Hobby Box - Possible Wentz,Goff,Prescott? ?